Here’s my ratatouille recipe, following fairly classic lines of vegetables and extra virgin olive oil, keeping close to traditions of Nice and the Provence region. Served with seared scallops and steamed baby bok choy, this is a healthy, delicious dish. I cut back on the oil, and go a bit heavy on the chile dulce (bell pepper). Because of the use of chile, this French dish resembles another chile dish from the Basque region in Spain, bordering France, piperade. A stew of bell peppers and tomatoes, piperade has no eggplant or mushrooms. I cooked the chile-laden dish for the first time during my visit to the Cordon Bleu in Paris a couple of hears ago, and I’ll share that recipe next time. I decided to make ratatouille last night for dinner because my weekly farm delivery included some eggplants. All the other ingredients had been in my fridge for a while, and this was a way to use them up to make a delicious dinner. In Houston I get a weekly delivery of vegetables from a very special urban farm, Finca Tres Robles. Tommy and Danny Garcia-Prats are two brothers who founded the farm in 2014. Their commitment to urban farming and the culture of sustainable eating is strong, of course, but it is also wise. Everything they do is linked to the culture of Houston’s East End, a mainly Latinx community. Their urban farm is 1.25 acres, located just 4 miles east of City Hall. I like their variety in their yearly harvest, and am looking to see what I can cook up with the next Finca Tres Robles vegetable delivery. 1. In a dutch oven heat the olive oil over medium heat, then add the onion and cook for 3 minutes until it becomes translucent. 2. Turn the heat to medium low and add the garlic and cook for one minute, then add the tomato paste and mix thoroughly to coat the onion and garlic. 3. 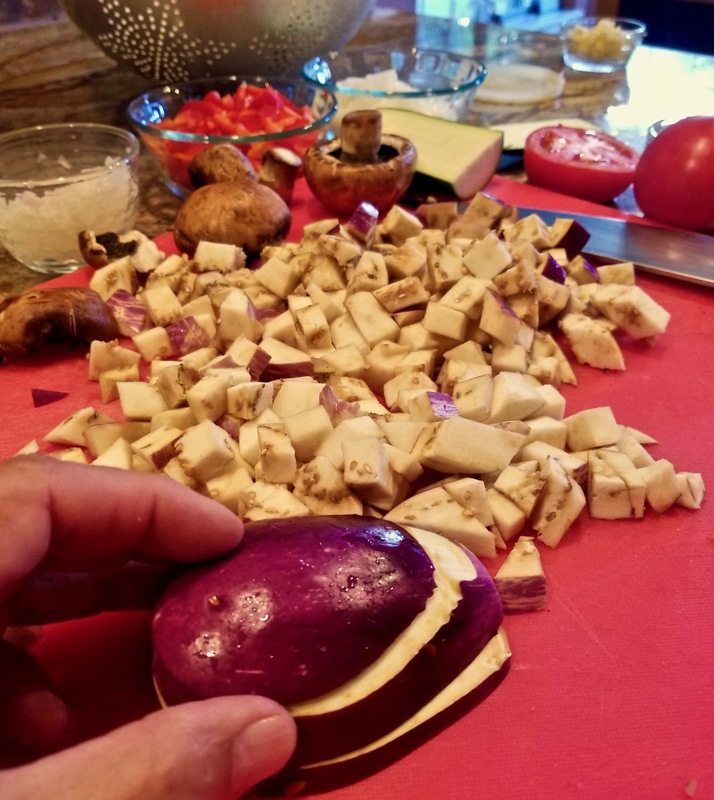 Add each vegetable and cook for 2 to 3 minutes each, in the following order: bell pepper, eggplant, zucchini, mushrooms and finally the tomatoes. 4. Add the stock and the parsley, oregano and basil. Cook on low for 10 minutes or until all the vegetables are fully cooked. The stock will evaporate somewhat so that the ratatouille is moist but not soupy. Taste and adjust the salt and black pepper. 1. Rinse the scallops and dry them with paper towels. Season with salt and black pepper. 2. 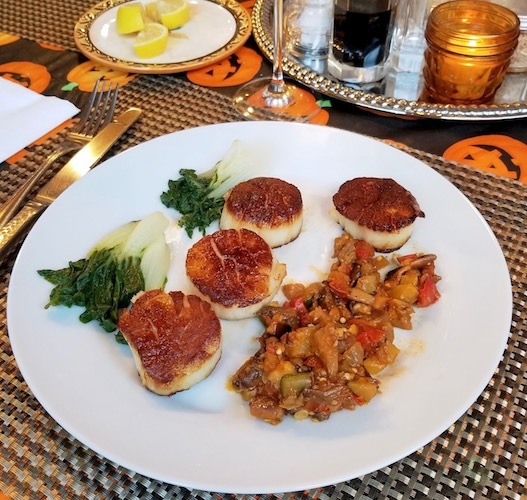 In a skillet, heat about 1 or 2 Tbs olive oil over medium high heat, 350ºF, and when the oil is wavy, add the scallops, spaced at least 1″ apart so as not to touch. After 30 seconds, reduce the heat to medium. The scallops will stick to the pan at first, but they’ll release from the pan as they cook. Flip them over after 2 to 3 minutes and cook another 2-3 minutes. If you like the scallops translucent, cook them 2 minutes on each side. If you like them opaque, like I do, cook them closer to 3 minutes. They will have golden seared edges. Serve immediately with the ratatouille and steamed bok choy.